A friend once asked, “Do you pray with your kids at breakfast? Why not?” We talked about it and I didn’t have a good reason for why not, other than that breakfast was a less formal meal around our house and often we didn’t all eat at the same time. I’d never thought about it before. I decided that since we’d be spending many hours in the car on the way to the Grand Canyon, there would be ample time for looking to God, reading his Word together, and talking about what we were reading. Why wouldn’t we do this when we were planning all sorts of other ways to pass the time in the car to avoid whining and fighting and wiggles? We brought along Meet the Bible and every day on the road we made devotions our first pastime as we traveled the highway toward our next stop. Grammy (my mom) was with us on that trip, and the time having devotions together turned out to be not just meaningful and not just God-focused, but a time we won’t forget. Grammy shared stories from her life as we all talked about the Scriptures. The kids listened and responded to her and asked questions about the stories. They didn’t complain, didn’t think any of it strange, and the presence of God permeated the trip in a way that felt natural, that felt good. Well, spring break has just ended, and another family vacation. This one quite different from that Grand Canyon road trip. 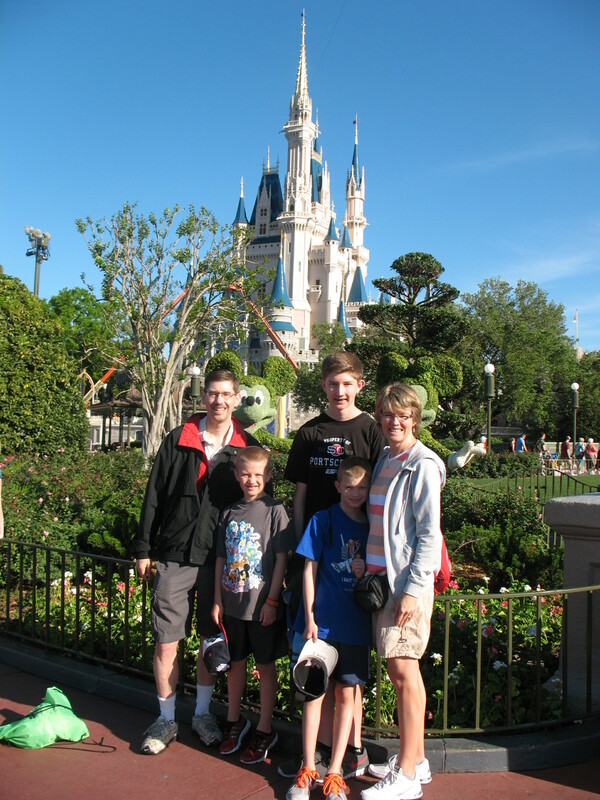 This time we flew to Florida to watch our high-schooler perform at Disney with his school band and choir. Devotions didn’t work on the airplane, but Good Dirt and a small Bible were tucked into my carry-on and we pulled them out at the hotel. Yep, spread across hotel beds we read and talked together. I have to say– it beat Direct TV hands down. And once again, sitting with God and turning to the Spirit in a land of magic, dreams, and wishes helped anchor us in the Kingdom that is true, dreams that are God-given and wishes that are prayers offered not just on our own behalf but for a world in need of the God of hope. Taking God on vacation needn’t look the same for every family. We didn’t get our devotion time in every day, and maybe your family time with God will take on a new and different rhythm from your time at home. Maybe you won’t use a book. You might speak Scripture from memory. You might focus your family time on prayer. Or on journaling individually. God will guide as you plan for vacation. His yoke is easy and his burden is light (i.e. not legalistic!). Ask for the Spirit to light the way to a plan that’s just right for your family’s next getaway. Then, when I bump into you and ask, “Do you take God on vacation?” you can tell me about all the ways you got away from home while getting closer to God in the face of new vistas and inspiring surroundings. I can’t wait to hear all about it!